Everyone’s talking about Account-Based Marketing – but is it the right approach for your organization? And, if it is, how do you create an end-to-end process for identifying, managing and marketing to target accounts?Join Part 1 of our ABM webinar series to find out if ABM is right for you. Predictive marketing is a hot new technology that’s been gaining ground providing marketers a better way to score leads. With the rise of ABM, B2B marketers are beginning to see the value of applying predictive technologies to drive their ABM strategy. Unlike traditional lead generation, predictive can identify the best target accounts that will most likely buy, discover non-intuitive insights for personalized messaging, and more. In this session, we will share examples of how predictive marketing can power your ABM strategy. There are 3,874 vendors listed in the 2016 Marketing Technology Landscape, and the phrase “MarTech stack” yields over 50,000 Google results. What’s a rational way to decide what you actually need? Join experts from DemandGen and Openprise as they provide a strategic framework for deciding what systems and what data you need to be successful. Every B2B marketing team faces the challenge of establishing a marketing dashboard to enable them to measure marketing’s impact on the business and communicate it to VP and C-level executives. For many, this initiative feels like a journey to find the Holy Grail. In this webinar, you’ll learn about each of the 5 stages for defining and building your marketing dashboard and how to approach some of the more challenging aspects such as data capture, campaign attribution, demand funnel models, measuring return on investment and sorting through the various reporting tools and systems. Join DemandGen for an exclusive “State of the Union” address on the Oracle Marketing Cloud from special guest Kevin Akeroyd, general manager and senior vice president for Oracle Marketing Cloud. Coinciding with Oracle’s first ever Modern Marketing Experience (taking place the following week in Las Vegas), David will ask Kevin to share his insights on what attendees can expect at the show -- including the future of Eloqua and Responsys, Oracle’s flagship B2B and B2C marketing automation systems. Join Baxter Denney, Director of Marketing Operations at New Relic, as he gives you a view into the anatomy of a high-impact Marketing Operations team. Baxter will share with you how a world-class Marketing Operations team can drive high growth within your organization. Join DemandGen for an exclusive “In the Spotlight” webinar featuring, Kevin Marasco, CMO of HireVue, and learn how he operationalized his Demand Funnel to improve pipeline and get results. Join DemandGen for an exclusive “In the Spotlight” webinar featuring client, Five9, on how they implemented Leadspace to double their lead volume. Learn from Leadspace CEO, Doug Bewsher, how the company delivers an automated, closed loop solution so your records are complete, fresh and properly scored against your campaign goals. Jim Bell, CMO of Jaspersoft and winner of the “Return on Integration (ROI) Award at the SiriusDecisions Summit 2014,” will tell his story of how Jaspersoft was able to get more out of the money they were spending on marketing while lowering their investment cost. Kathy Macchi, our DemandGen data and analytics expert, will share the six principles and recommendations for marketers who want to become best-in-class. Kathy’s focus on analytics is developing models to bring fact-based assessment to lead management that will help marketers build more effective lead generation and nurturing programs. Join the Co-founders of SiriusDecisions and BrightTALK in this video session as they discuss the key themes of the upcoming SiriusDecisions Summit Europe taking place in London 5 & 6 November 2013. Marketers are no longer measuring the success of their programs with simple metrics: opens, clicks, or page views. They are now challenged to align success metrics to prospects, leads, and pipeline development. However, is that enough for modern marketers to earn a seat at the revenue table? In order to grow a business, team and career, marketers need to know their contribution to the bottom line. Join David Pitta, as he shares how his team grew revenue in 12 months by 519%, increased the team from 5 to 15 people and furthered his career to senior management. These best-practice insights have been honed through thousands of successful campaigns. How modern marketers can leverage a prospect’s “digital body language” to determine engagement and likelihood to buy. Your buyers are evolving and they are changing the buying patterns that we’ve traditionally observed. It’s stating the obvious that B2B Customers will take certain actions and make certain decisions in order to buy your products and services. But are these activities random? Are there patterns you can detect and leverage? Based on qualitative research conducted from companies using marketing automation and CRM systems, this webinar will teach you 10 ways to leverage online buyer behavior for your content strategy, lead scoring modeling, nurture triggering, and sales insight. Join us for this exciting webinar hosted by David Lewis, CEO of DemandGen International, Inc. (www.demandgen.com) and author of Manufacturing Demand – The Principles of Successful Lead Management (www.manufacturingdemand.com). Demand Gen are the world’s leading consultancy for Integrated Lead Management, Marketing Automation and Inbound Marketing. 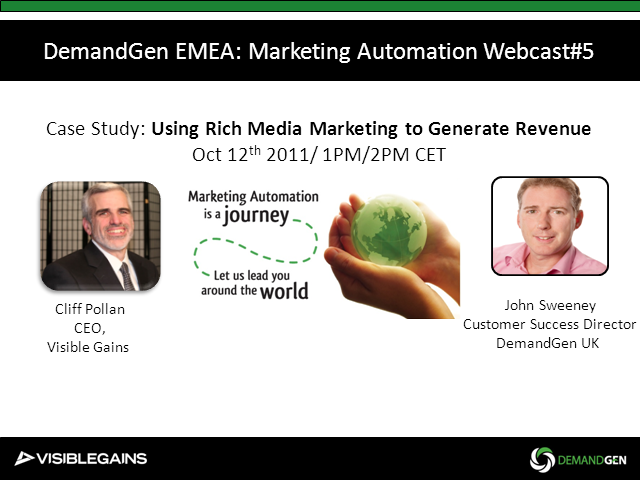 In this webcast John Sweeney and Richard Harris from DemandGen will provide practical insights learned from projects with data driven marketing departments. In this session you will discover how a data driven marketing approach feeds an integrated lead management system and delivers an increase in marketing attributed revenue. Content includes case studies from award winning clients leading the successful deployment of marketing automation platforms. Browse our insightful webinars around lead management, demand generation, and using marketing automation technology most effectively to drive revenue for your organization.